Virtual reality (VR) has potential to revolutionize some aspects of medicine and healthcare. Several medical specialties are already using it to train physicians and assist diagnosis and it also has potential for treatment. A group of cardiologists has now successfully used a VR device to guide the opening up (revascularization) of a chronically blocked right coronary artery. Their report is published in the Canadian Journal of Cardiology. Chronic total occlusion, a complete blockage of the coronary artery, sometimes referred to as the “final frontier in interventional cardiology,” represents a major challenge for catheter-based percutaneous coronary intervention (PCI). This sentiment is driven by the unpredictable procedural success rates related to the difficulty of recanalizing chronic total occlusions with percutaneous techniques as well as incomplete visualization of the occluded coronary arteries by conventional coronary angiography radiology methods. Consequently, there is substantial interest in using novel imaging methods for preprocedural characterization of chronic total occlusion. Coronary computed tomography angiography (CTA) is increasingly used to provide physicians with guidance when performing PCI in this subset of lesions. The occluded coronary segment and the distal vessel territory are often more clearly depicted using coronary CTA than in invasive angiography. Of particular interest, the procedure itself can be facilitated by projection of three-dimensional CTA data sets on separate monitors in the catheterization laboratory, but this technique is constrained by economic and technical factors. Cardiologists from the Institute of Cardiology, Warsaw, Poland were able to successfully restore blood flow in the occluded right coronary artery of a 49-year-old male patient assisted by CTA projections in a wearable VR device based on Google Glass, with an optical head-mounted display. The display of three-dimensional computed tomographic reconstructions in a mobile application equipped with a hands-free voice recognition system and a zoom function, developed specifically for this purpose by a team of physicists from the Interdisciplinary Centre for Mathematical and Computational Modelling of the University of Warsaw, enabled the physician-operators to clearly visualize the distal coronary vessel and verify the direction of the guide wire advancement relative to the course of the blocked vessel segment. The procedure was completed successfully with implantation of two drug-eluting stents. “This case demonstrates the novel application of wearable devices for display of CTA data sets in the catheterization laboratory that can be used for better planning and guidance of interventional procedures, and provides proof of concept that wearable devices can improve operator comfort and procedure efficiency in interventional cardiology,” explained lead investigator Maksymilian P. Opolski, MD, PhD, of the Department of Interventional Cardiology and Angiology at the Institute of Cardiology, Warsaw, Poland. The device used, Google Glass, consists of a wearable, hands-free computer with an optical head-mounted display worn by interventional cardiologists in the catheterization laboratory. The optical head-mounted display can display and capture images and videos while interacting with the surrounding environment. This display is an example of the concept of VR in which the user is supplemented with additional information generated by the device. CTA images displayed in Google Glass. (A) Cardiologist viewing the CTA images in the upper right visual field on Google Glass (Google Inc, Mountain View, CA) (arrow) during a CTO recanalization attempt. 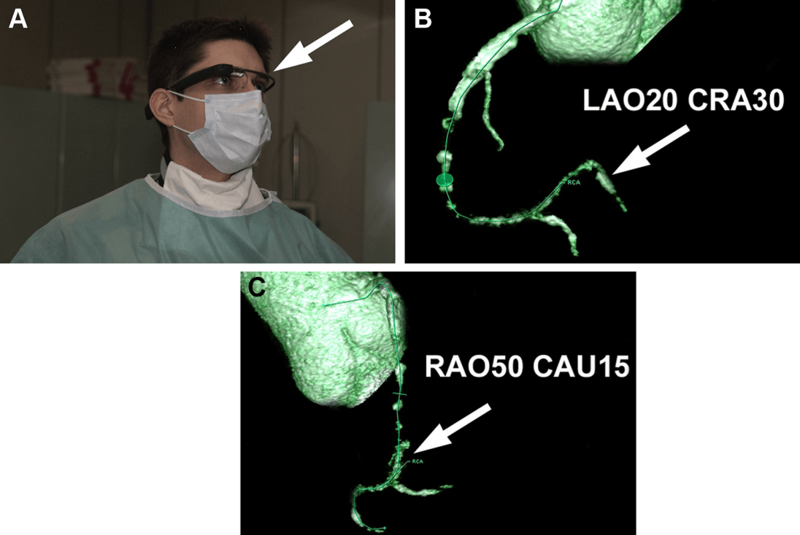 (B, C) Three-dimensional reconstructions projected directly onto the Google Glass screen reveal the exact trajectory of the distal right coronary artery (RCA, arrows). CTA, computed tomography angiography; CTO, chronic total occlusion; RCA, right coronary artery. “First-in-Man Computed Tomography-Guided Percutaneous Revascularization of Coronary Chronic Total Occlusion Using a Wearable Computer: Proof of Concept,” by Maksymilian Opolski, MD, PhD; Artur Debski, MD; Bartosz A. Borucki, MSc; Marcin Szpak, MSc; Adam D. Staruch, MD; Cezary Kepka, MD; and Adam Witkowski, MD (DOI: http://dx.doi.org/10.1016/j.cjca.2015.08.009). Published online in advance of its issue of the Canadian Journal of Cardiology, published by Elsevier. The article will be accompanied by two videos. Full text of this article and editorial is available to credentialed journalists upon request. Contact Eileen Leahy at +1 732 238 3628or cjcmedia@elsevier.com to obtain copies. Journalists who wish to speak with Maksymilian P. Opolski, MD, PhD, directly may contact him at +48 501444303 or opolski.mp@gmail.com. The Canadian Journal of Cardiology is the official journal of the Canadian Cardiovascular Society. It is a vehicle for the international dissemination of new knowledge in cardiology and cardiovascular science, particularly serving as a major venue for the results of Canadian cardiovascular research and Society guidelines. The journal publishes original reports of clinical and basic research relevant to cardiovascular medicine as well as editorials, review articles, case reports, and papers on health outcomes, policy research, ethics, medical history, and political issues affecting practice.